A mysterious and beautiful haze of light setup in the sky of downtown Los Angeles in the month of July, possibly alien invaders but more likely a refraction of light in the atmosphere. It seems these days any strange occurrence in the sky brings forth new conspiracy theories. Often observers of phenomena cry out aliens, or secret government projects, or scream the end of the world. In the past maybe people saw the gods and angels when they viewed such phenomena. While taking a work hiatus in downtown Los Angeles, after putting in 7-days straight, looking up in the sky this beautiful blue glimmer, similar to a rainbow in the form of a cloud greeted the eye, and what a fabulous and pretty sleep-derived hallucination above head came to mind first. Unfortunately, once again working with a cell phone camera our photos don’t do justice to the phenomena, but to make up for our lack of technology we offer an explanation to the mystery. No, the shimmer in the sky wasn’t an inter-dimensional gate opened by an evil alien or demon race in an attempt to conquer our planet, though if that was the case they might cancel work. The beautiful blues with the slight shade of pink like a rainbow came from refracted light. Unlike a rainbow the light didn’t reflect of water drops falling from the sky, but instead from ice crystals high up in the atmosphere. 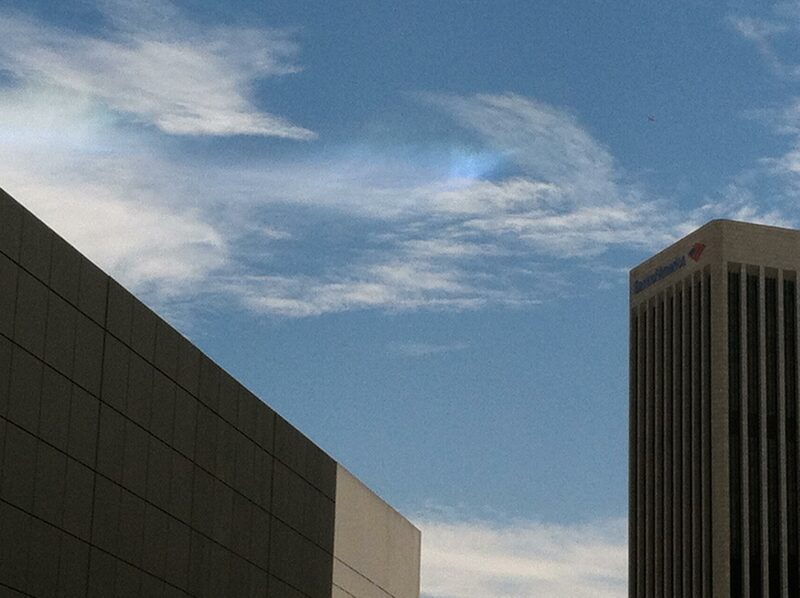 The mysterious glimmer most likely was a circumhorizontal arc, but could also be a circumzenithal arc. Both are phenomena produced by ice crystals and many call them ice halos. If interested you can look at this site here, and if you scroll down you can get all the good information and science-type answers. Another great site with information is Atmospheric Optics. If you do visit this site search until you find the picture of the 44-degree parhelia, well worth the searching. It is amazing the many beauties produced by this world and if we are lucky enough we might just get to experience. Please find the better picture below. 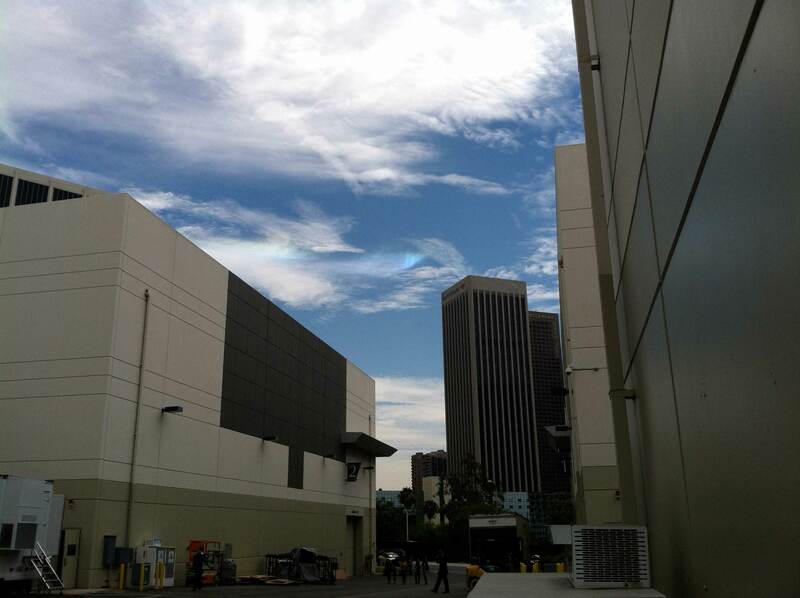 This entry was posted in Downtown LA, L.A., LA, Los Angeles, Science and tagged atmosphere lights, circumhorizontal arc, downtown los angeles, ice halo, light refraction, Los Angeles the Blog, science. Bookmark the permalink.